Overview : Play your dance game with an arcade feeling with this dancing mat compatible with Nintendo Wii and Gamecube. Made of high quality material, slip proof and durable, it is perfect to enjoy dancing games to the most! Quality/Usability : Having purchase Dance Dance Revolution Hottest Party, it only comes with one Official Konami dance pad. Its hard to find an extra Konami dance pad that is sold separately. Luckily, 3rd party manufacturers are always there to pick up the slack of official products. Dragon has released a dance pad that is compatible with both the Wii and GameCube. So now, I can get my friends to join in with me instead of taking turns. The pad is made durable plastic similar to that of the official pads. Size is the same and the plug connects to the Gamecube port. The mat measures 925mm x 790mm. You have the usual UP, DOWN, LEFT and RIGHT arrows. On the top left corner is a "B" button and top right is a "A" button. The middle of the pad has a silhouette of Mario break dancing from the Mario version of DDR that was released on the GameCube. The Wii recognizes the dance pad and during gameplay, it does pretty well. It was able to recognize my stomps or dance, if you want to call it that. There were times where it wouldnt recognize but that could be user error as we all miss the arrows in the heat of a dance off. 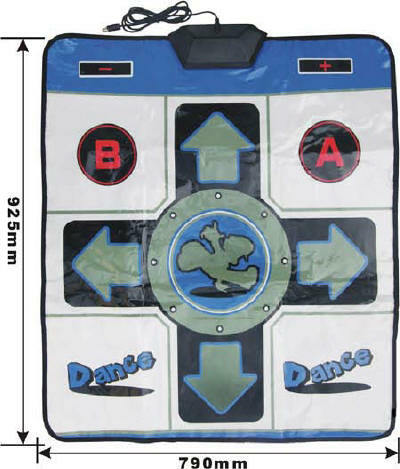 Conclusion : Overall, the Wii DDR Dance Advance Mat performed on par with the Official Konami dance pad. Personally, I'm the type that prefers official products. The price of an official dance pad of $40-$50 is a bit pricey compared to the $14 3rd party accessory that works just as good. I paid $60 for Official DDR pads a long time ago for my PS2 DDRs and ended up selling them for more than half of what I paid. So if you're the type to get rid of your games or trade them (via Goozex.com or Goozex.eu) and dont care if its official product so as long it works, I definitely suggest picking this up. It will save you some money. Guests online: 439. Total online: 441.